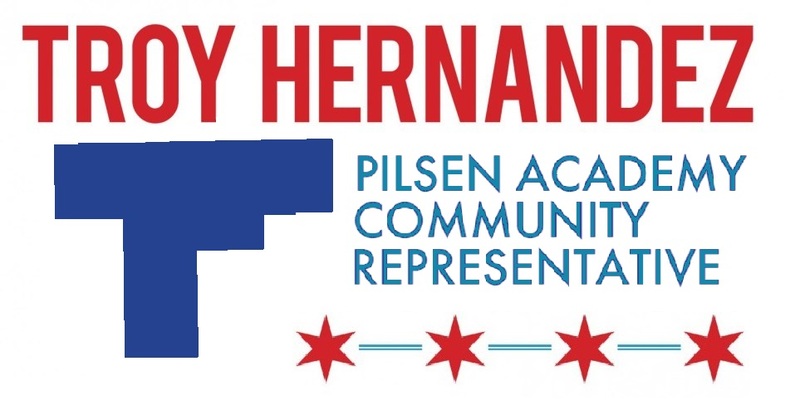 I’m running for another 2-year term on the Pilsen Academy Local School Council (LSC). As the community representative and secretary, these past 2 years have been a lot of work, but it’s been worth it. Last week, the LSC voted to offer a contract to our new principal; Leanne Hightower. She will be starting next week! Leanne comes to us with a JD from U of I, masters degrees in education and school administration, 5 years of teaching experience and 4 years of administrative experience. With an almost unanimous decision (9 in favor, 0 against, 1 abstention) the LSC showed that it is very excited for this fresh start. We worked very hard and very closely with parents, members of CTU, CPS administrators, and the community to bring in this strong candidate. It hasn’t always been easy, but knowing that I’ve been able to make a difference in the lives of teachers, staff, and students at my neighborhood school has made it worthwhile. My hope is that the kids at Pilsen Academy can get the kind of high-quality public education I got in the suburbs. Hiring our new principal is the first step in that direction and we’re all excited for the next steps with her leadership. I hope I will be able to work with her over these next two years. I’m running with some friends I’ve made from the current LSC; President Dolores Cortez, parent representative Maria “Lupe” Gonzalez, along with parent representative-hopeful Kay Allen, and community representative-hopeful Teresa Gonzalez. When I was first elected to the LSC two years ago, I thought I was signing up to practice my Spanish over bad coffee at an early morning meeting once a month. My hope was that, as a Mexican-American with a PhD in statistics, I could serve as a role-model to the neighborhood kids. I would give a few STEM talks/demos (science, technology, engineering, and mathematics) and I’d have done my duty. My two years were unfortunately not so easy or pleasant. Walking home from the first official LSC meeting a couple of council members followed me out, pulled me aside, and said that they wanted a new principal. They said that the current principal had created a culture of fear and was driving good teachers away. They wanted my help. I was skeptical and wondered what their angle could be. The principal seemed nice enough on election night. The Pilsen Alliance “volunteer” that was helping me out, Vicky Lugo, said he was terrible. I was apt to believe the opposite after it turned out that the organization was filled with political opportunists. Then I started to notice some troubling behavior from the principal. I presumed incompetence before I presumed malice. As I became acclimated to the process, I started to ask questions. My honest questions were repeatedly met with violent responses from the principal… like the time I respectfully questioned increasing his unsupervised spending limit from $1,000 to $10,000. I thought that if he was comfortable yelling at one of the people responsible for approving his contract, I could only imagine what it was like to have to work for him. That our teacher turnover rate was 50% higher than the rest of the neighborhood’s schools and twice the rate of the state’s schools only affirmed my judgement. I kept my politics separate from my service at the school. I initially made no mention of my election to the LSC here on my blog. When I was collecting signatures for my aldermanic run, none of the members on the LSC knew about it until it was over. The principal was not so noble. He got rid of the teacher representative on the LSC (and his brother), he repeatedly prevented the LSC from conducting its business, and held illegal meetings. In December, the LSC decided to not renew the principal’s contract by a vote of 7 – 2 – 1. We thought that with things settled we would be able to focus on moving forward. Nope. The principal decided to play games. He proposed a $60,000 budget transfer with no advance notice to the LSC. The LSC was confused (translations are frequently lacking) and punted with 6 parents and staff abstaining from the vote. He then sent a letter home to the parents and teachers accusing the LSC, specifically me, of trying to ruin the school. This was followed by more chaos, including teachers getting uncharacteristically bad reviews and posted LSC agendas disappearing. In response, the LSC voted to send a letter to CPS CEO Forrest Claypool. We requested that Dr. Ali be removed from the school immediately. This was just over 45 days ago. Last week, I was informed that Ali had started threatening undocumented parents with calls to immigration. Those parents complained publicly to the CPS Board last week. Monday was Dr. Ali’s last day at Pilsen Academy. While it’s been great to work and serve with the families in my community, I’ve been put off by the amount of politics in a grade school. It hasn’t just been the principal either. Local polluters make donations for the school’s floats in parades and members of Pilsen Alliance have used it as a pawn and propaganda piece. But I guess I shouldn’t be surprised. This is Chicago. Politics are in the bricks that were used to build this school over 100-years ago. The best we can do is to show up and try to minimize the negative effects that politics has on the school. The current LSC and the new principal are in agreement on that matter. My hope is that we can maintain this mindset during and after the election. Then we’ll be able to get to the more important and fun things in the school. Next Post Re-elected to the LSC! My thought is wow and I willingly send my kid to this school. I wasn’t aware there were so many problems in the school regarding the principle. I did see many great teachers make their exits after one year there, I thought it had to do with Cps and union problems. This has greatly open my eyes and am grateful to you for archiving these events so I may learn what has been going on in the school and our community. Thank you and the other members of LSC. Teacher turnover in CPS is a problem in general. But the problem was exacerbated at Pilsen Academy. I still expect that we’ll be losing teachers due to budget issues making CPS akin to baseball’s farm system for suburban schools.